blueadt ~ >Home At Last…..
She was happy to leap into the car & ran into the house. Her bed has been slept on, the new mat in front of the fire tested & Oscar’s bed sampled. 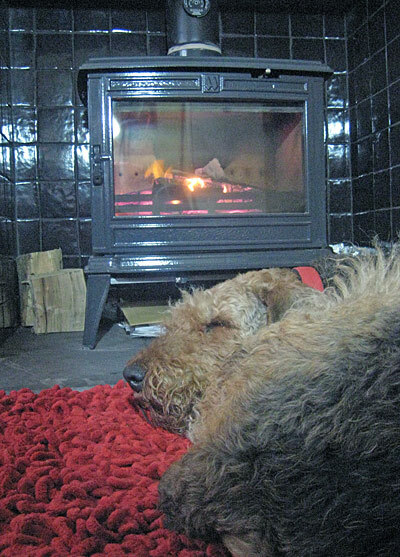 She’s currently back in front of the fire totally stretched out & snoozing. It must be like being in hospital when you come home absolutely shattered having had no rest at all. >ahh, what a happy looking dog! I hope that 2009 is much much better for you than 2008. >Welcome home Annie, glad you are better! What a lovely photo of a contented Annie. >Lovely to see Annie so contentedly back where she belongs … and truly hope that 2009 is a much better year for you and yours. >glad to see Annie home and snuggled up happily by the fire! This is a promising start to what I hope is a wonderful year for you and yours! >So glad Annie is back! We’re taking Scruffs in tomorrow for an op on his Cherry Eye. Hopefully he won’t be staying in though and can come later on.